There’s something awfully familiar about Curtain Call. A boozed-up washed-up actor burning through his old relationships… isn’t that Simon Brett’s Charles Paris? A misanthropic artiste, full of high-flown language and infuriated by his too-successful old friend… isn’t that Ed Reardon? A winking in-joke of theatrical secrets…isn’t that too many productions to count, but topically Phoenix Buchanan in Paddington 2? The thing is, all those forerunners are great fun. I went to Curtain Call with hopes that, although not dazzlingly original, it would be an enjoyable evening. To a great extent, that’s just what it is. The setup is promisingly full of tension: protagonist Stan (Simon Bradbury, also the playwright ) is the finest Shakespearean character actor of his generation, introduced at the nadir of doing dinner theatre on Southend pier. 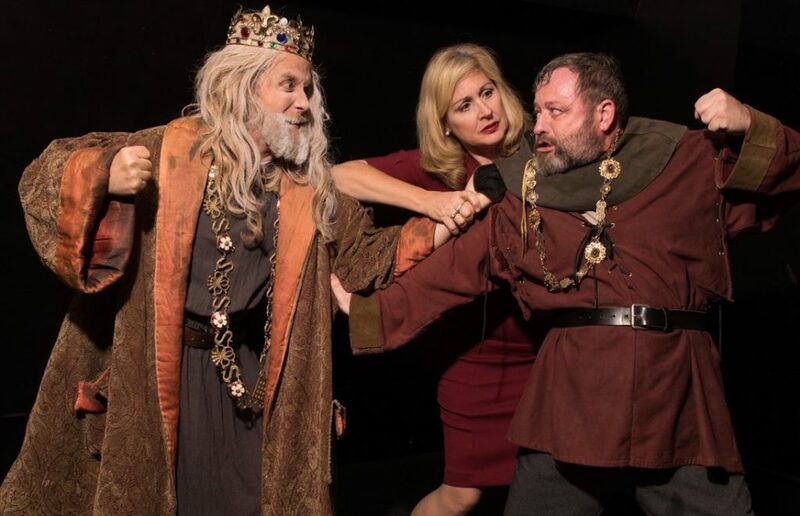 His ex, rising director Shelley Klein (Heide Yates), tracks him down offering a return to the classical theatre, as Gloucester in King Lear. The snag? Lear will be played by his old friend, leading man and TV star Rod C Tanner (Aran Bell), who took Shelley away from him seven years ago, and who also did the dirty over said TV stardom, which should have been Stan’s. But in between these heights, Curtain Call doesn’t really satisfy. The dialogue is mannered even when it’s not lifted from other dramatists. There is some clunking exposition for all three characters. Highflown theatrical sentiment collides with repetitive fart jokes, and neither comes off well. Cruelly, the setup demands the actors be perfect: a play that pivots on one character’s inability to remember lines really suffers when the actors fluff theirs – awkward audience silences followed those moments. Above all, that there should be a happy ending, given the state of the characters at the start, particularly Stan’s drinking and memory crises, feels too neat. On that score, the lack of originality isn’t helpful: I’ve been trained by Charles Paris and Ed Reardon to know that boozers and misanthropes never find a neat finale. The highs of Curtain Call aren’t quite high enough, and the lows aren’t really followed through to the depths. It’s enjoyable, occasionally edgy, often uneven, and if you like meta-theatrical musings and in-jokes, you will find plenty to please you. But my socks were resolutely not blown off.